You have written your social media policy, check. You worked through our first 5 Tips to a Streamlined Social Media Plan, check. Now what? Just like you use measurable outcomes to determine if your programs are working or not, metrics provide invaluable insights to your community. What does your community enjoy hearing about? What do they need to know? What do they want to know? A big component the first year of using social media is listening. Not physically listening but listening to what your community tells you through their actions, reactions or in-actions. Many of these can be determined through metrics. Hootsuite, Facebook and Twitter have intuitive metrics. Make sure you have enabled metrics on your website (if you’re using wordpress access the “JetPack” plug-in), you can also access metrics on Pinterest easily. Beth Kanter, nonprofit social media guru, walks you step-by-step how to make SMART goals and then standardize them (extremely helpful if you are attempting to get a grant for social media purposes). The confusion around whether or not you can measure social media has moved from “you can’t measure social media” to figuring out what to measure. Setting aside time specifically each week or each month will help you make analyzing metrics habitual. Don’t be afraid of them or look at it like a chore. This is free feedback from your community. Use it! 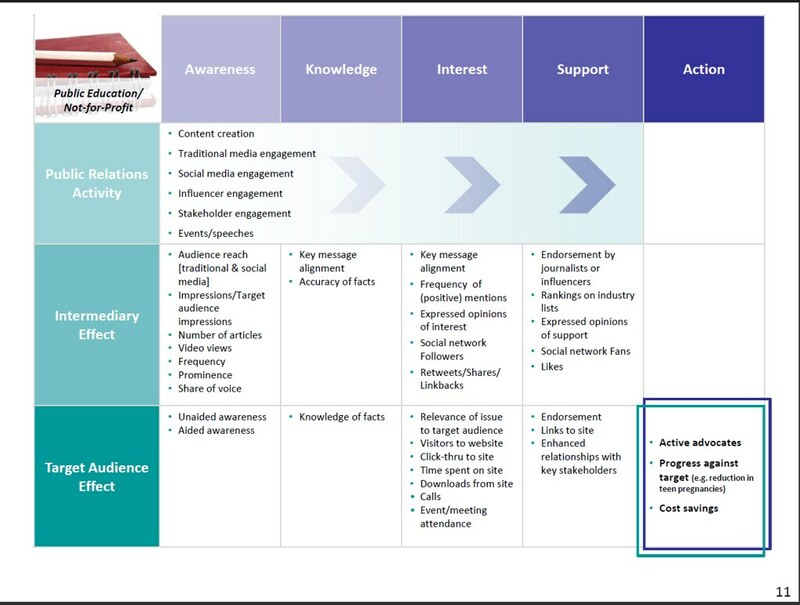 Focus on Target Audiences Are we fostering meaningful conversations with target audiences? Focus on Influence Do the people we seek to reach look to our organization as a leading authority? Do they come to us first for the latest information and resources? Focus on Trust Do the people we have relationships with on social media trust our organization and the information and resources we share? This also relates to our influence, which we highlighted above. Focus on Commitment and Conversion Rates Do people feel committed to our organization and the work we do? Are we moving people up the ladder of engagement and getting them to take an important action on behalf of our organization because they feel passionate about our mission? Focus on Engagement That Connects to Mission Are we measuring engagement based on our organization’s mission and key goals? Kivi Miller of Nonprofit Marketing wrote a great piece about why it’s appropriate to speak differently on each platform. You are rocking at your current methods of communication. You’ve found where your audience lives and feel like you’re getting great interaction. You have extra time (maybe?) and some extra zeal and want to attract even more people, convert some dormant followers, or test a new market. Yes It’s time to add an additional platform. Now, what that looks like for your organization is different than the organization next door. It is time again to define what those goals would be for an additional platform and make sure you have the right one. The Atlanta History Center has a great following on all its platforms. They decided to add instagram to their arsenal. But, wait, isn’t instagram pictures of what’s currently happening? You are supposed to use instagram to humanize your organization? Yes, they found the same issue, their audience wasn’t as engaged with pictures of the building workers, etc. That was until a few weeks ago, someone on their marketing team (they get my accolades) came up with a genius hook. “Wouldagrammed” Each day they post old photos in history from the center, with a brief description and the hashtag #wouldagrammed Their user engagement is up by 20% on instagram and they have added new users every day. The best part is the photos are all parts of exhibits in the center, encouraging those viewing them to either donate, visit or pass it along. Perfect!! Are you going to know everything you’re doing? No. Should you? Ehhhh maybe, but most likely no. If you’re bored or completely content with how you’re marketing and interacting with your audience chances are things have gone stale. Constant reassessment and retooling help keep your organization fresh and in tune with what is at your fingertips. Don’t be afraid to try and fail miserably. The best way to learn is to try and a good percentage of the time the most effective learning happens through failure. You have to accept the fear and the uncomfortableness in order to fail or succeed! So get out there and try something new then let us know about it! We’d love to cheer you along.